An average adult needs to consume a minimum of 130 grams of carbohydrates a day for proper function. One cup of cooked sweet corn contains 31 grams. Carbs are used by the body for mental and physical energy. This is especially important for athletes, who need more carbs to drive their performance. When these macronutrients are consumed, they get stored as glycogen, which is then used for energy during short and long periods of exercise. Athletes should aim for at least 250 grams of carbs a day for optimal performance. Two cups of sweet corn makes up nearly one-fourth of this amount. Protein is a second macronutrient that the body also needs in high amounts. It functions to repair cells, build muscles and boost the immune system. Sweet corn has a moderate amount of protein for a vegetable. A 1-cup serving contains just over 5 grams. The total recommended daily intake of protein is 46 grams for women and 56 grams for men. If you are looking to boost the protein content, use sweet corn as a side dish with a lean beef steak, chicken breast or pork loin. Sweet corn is also low in fat. A 1-cup serving contains about 2.5 grams of total fat and less than a 0.5 grams of saturated fat. Adding butter to your corn will impact the fat content. A single tablespoon adds over 11 grams of total fat and 7 grams of saturated fat. Sweet corn has a moderate amount of dietary fiber. One cup contains just over 3.5 grams. Adult men should try to consume at least 30 grams of fiber a day, and women should get at least 20 grams. Fiber is a nondigestible form of carbohydrate that helps stabilize blood sugar levels, prevent constipation and reduce the risk of high cholesterol. It also helps you feel full for longer after you eat it. This is especially beneficial if you are trying to lose weight or maintain weight. Pairing corn with beans and other vegetables in a salad or soup will give you an extra shot of fiber. Potassium is an electrolyte mineral commonly lost through sweat during long bouts of exercise. It is needed for heart function, muscle contractions and bone strength. Corn has a moderate amount of potassium. A 1-cup serving contains 325 milligrams. The total recommended intake is 4,700 milligrams for adults over 19 years old. Pairing sweet corn with beans, potatoes or spinach will boost the potassium content. Vitamin A is an antioxidant which helps protect the body against harmful free radicals. Additionally, it helps keep the connective tissue strong and it moistens the mucous membranes in the lungs, throat and nose. 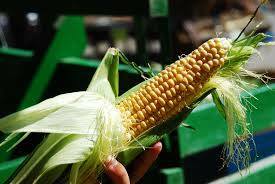 Sweet corn contains 310 international units of vitamin A in 1 cup. The recommended daily intake of this vitamin is 3,000 international units for men and 2,000 international units for women. Having a meal with sweet corn and winter squash, carrots or sweet potatoes will increase the vitamin A content.